This image from one of the cameras on NASA's Solar Dynamics Observatory shows the sun as it appeared on Jan. 24, 2012. The sunspot grouping in the upper right of the sun's disk is known as Active Region 1402, a sunspot region responsible for recent solar storms. The prominent spot on the left is region 1408. When an intense solar flare erupted from the sun this week, it exploded from a busy sunspot on the surface of our nearest star. The sunspot, which scientists call Active Region 1402, appears as a huge blemish moving across the northern region of the sun in photos snapped by NASA's Solar Dynamics Observatory and other spacecraft. In addition to firing off several flares in recent days, the sunspot unleashed a powerful eruption late Sunday night (Jan. 22) to create the strongest solar radiation storm since 2005 to hit Earth. That radiation storm is bombarding Earth today and may spark dazzling northern lights displays for skywatchers at northern latitudes where it is currently night, NASA scientists have said. It may also create minor interference with satellites in Earth orbit, but poses no threat to the six astronauts currently living on the International Space Station, they added. Sunspots on the solar surface arise from intense magnetic activity on the sun. This activity can block the flow of heat through the sun's convection process, which in turn causes some areas of the star's surface to cool down. These cooler regions appear dimmer than their surrounding areas, creating the dark blemishes known as sunspots. Sunspots are temporary features on the sun that can last for several days or up to several weeks. They typically range from 1,500 miles to 30,000 miles (2,500-50,000 kilometers) in size. One of the largest sunspots in recent years occurred in late 2011, when a sunspot about 50,000 miles (80,000 km) long, and 25,000 miles (40,000 km) wide was spotted by space telescopes. The sun's sunspot cycle lasts 11 years and serves as a key identifier for the solar weather cycle. 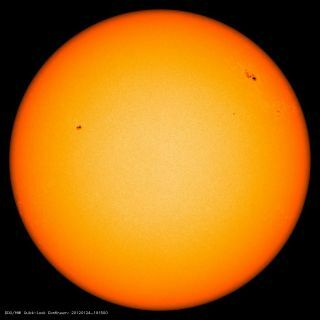 Right now, the sun is in an active phase of its current weather cycle — called Solar Cycle 24 — which is expected to peak in 2013.